Need a great veggie burger recipe? Look no further! 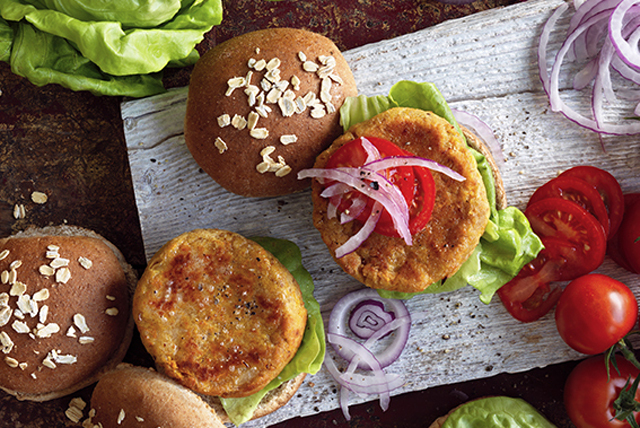 Our Red Lentil Burgers are a real winner! Heat dressing in large skillet on medium heat. Add mushrooms, onions and garlic; cook 10 min. or until vegetables are tender and mushrooms are evenly browned, stirring occasionally. Spoon vegetable mixture into food processor container. Add all remaining ingredients except carrots and buns; process until blended. Transfer to bowl; stir in carrots. Shape into 8 (1/2-inch-thick) patties; place on baking sheet sprayed with cooking spray. Bake 18 to 20 min. or until heated through, turning after 10 min. Serve in buns. Prepare using 1 rinsed can (19 fl oz/540 mL) cooked green lentils. Heat greased barbecue to medium-high heat. Grill patties 15 min. or until heated through, turning after 8 min. Add 1-1/4 cups uncooked dry red lentils to 1 L boiling water in saucepan; stir. Return water to boil; cook 10 min. or until lentils are very tender and beginning to fall apart. Drain in fine-mesh strainer; press gently on beans to remove excess liquid. Cool.